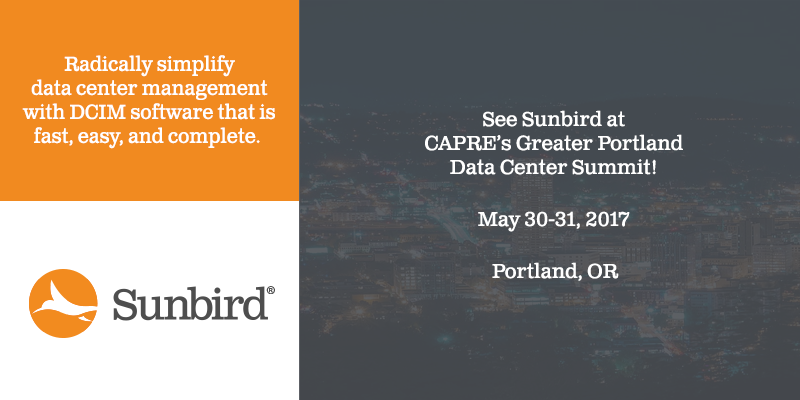 Sunbird is excited to be participating in CAPRE's Greater Portland Data Center Summit from May 30-31, 2017 at the World Trade Center Portland. Come talk to us, meet our data center experts, and get a demo of our award-winning Data Center Infrastructure Management (DCIM) solution at this upcoming event. If you're active in Portland's data center industry, looking to network with your data center peers, or are simply looking for tips and best practices to improve your data center management, you won't want to miss the Greater Portland Data Center Summit. You'll gain a comprehensive understanding of data center market and technology infrastructure opportunities and challenges. Take advantage of 13 hours of educational sessions and network with over 300 senior-level data center real estate and technology infrastructure executives. Sunbird's DCIM software helps data center professionals like you optimize and simplify data center management. Whether you're looking to improve your data center asset and change management or want a solution that monitors the power, environment, and connectivity across your data centers, we can help you boost productivity while reducing costs. Heading to CAPRE's Greater Portland Data Center Summit and want to chat one-on-one with a DCIM expert? Our local Sunbird representatives will be available for individual meetings. Let us know if you’d like to meet.